Meat production is a demanding process. This process encompasses the entire life cycle of some animals from breeding these animals until the moment when it comes to your kitchen table. No wonder that the process of meat production uses so many resources such as land, water and food. It takes a lot of livestock to feed 7 billion people, even though the food is not equally distributed among the people in the world. Per year, in industrialised countries 76.2 kg of meat is consumed per capita while in the developing countries this number is significantly lower. In developing countries only 33.5 kg of meat is being consumed per capita per year. There are huge differences among consumption of meat even in the same countries. How much meat do you consume per year? Livestock industry has a huge impact on water supply available to us. The water is being used for watering the crops they eat, for drinking water and for cleaning the farm houses and transport trucks. There are huge differences between water usages among various kinds of animals. For example, average annual water footprint for dairy cattle is 2056 cubic meters per year per animal while the water footprint for broiler chicken is only 26 cubic meters per year per animal. When you compare that numbers with ecological footprint for 250 grams of soy curd which is 0.75 cubic meters, you can see the difference in ecological impact between meat production and crop production. The needs of livestock industry are causing deforestation in humid climates because the land is needed for pastures while in arid climates desertification is happening. Huge amounts of land are being degraded by livestock farming which puts food production at risk in the future. 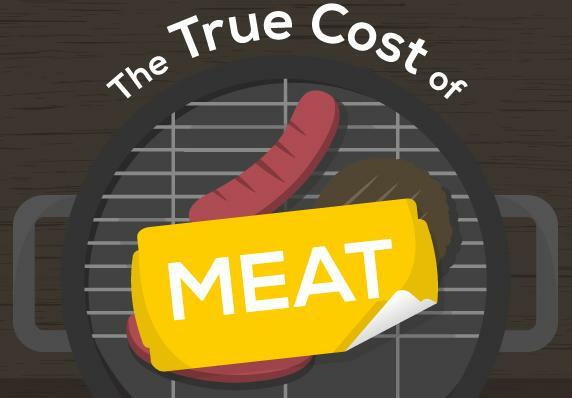 In this interesting infographic you will find interesting statistics about true cost of meat.